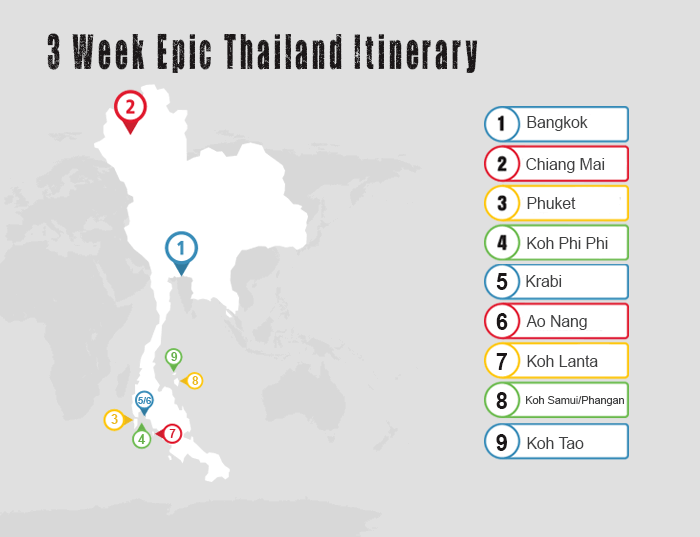 The Best 3 Week Thailand Travel Planning Guide For Backpackers! 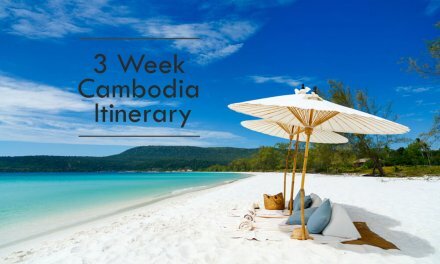 The Best 3 Week Thailand Travel Plan for Backpackers! First of all, congrats on adventuring to Thailand! Thailand is a magical country, nicknamed the “land of smiles” you will find culture, some of Asia’s most amazing beaches, delicious Thai cuisine, entertainment and adventure. Thailand has a lot to offer as a travel destination for whatever type of adventure you are looking for, relaxing or adventurous. If you are reading this post and are the type of nomadic traveller that wants to see it all then this is the post for you! After spending 6 months in Thailand we wanted to put together our personal recommendations for you. That was you can arrive in Thailand ready to make the most out of your adventure with the ultimate travel itinerary for Thailand. Before we begin, you must ask the question, what type of traveller are you? Think about whether you prefer to settle into a destination and really get to know the area and explore more than just the “top tourist things to do” or if you want to see it all and not afraid of a lot of travel in between. Fair warning this is a lot to fit into 3 weeks so we wanted to include our highlights and best travel tips. To skip to a specific section, use our quick links below for easy navigation. No riding elephants here, only playing with some of the happiest elephants you will ever see. Imagine learning how to scuba dive at the exact spot a lot of people set as their screen savers. It sounds nuts (yes actually biking around Bangkok) but this was hands down the best way to experience Bangkok. Besides breaking down and having another boat come and rescue us, this was the best way to explore some of the most stunning beaches we have ever see. Renting the motorbike is an experience in itself! 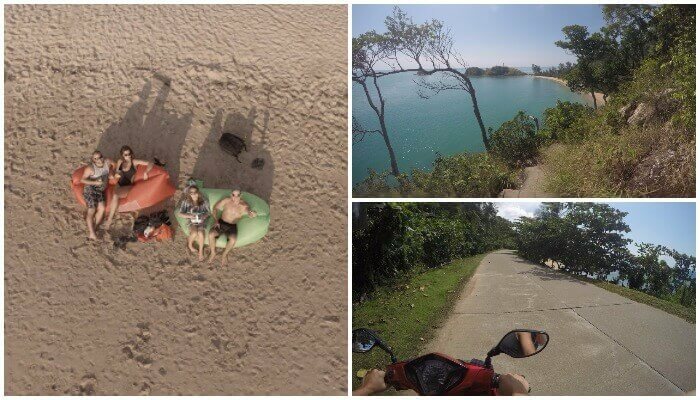 You will be sure to have a smile on your face motorcycling around this wonderful Island where you can explore all the hidden gems and beaches without all the traffic. We also created a Google Map guideline as well. Click here. Bangkok is Thailand’s Capital and welcomes more visitors than any other cities in the world! The majority of traveler’s land in Bangkok because it has a major airport and is usually the cheapest city to fly into. Bangkok has anywhere from 10-15 million people there at any time. If you are not a fan of big cities, then you should plan to spend as little time as possible here. Big cities are probably not what you think of when visualizing Thailand, unless you are remembering the movie “The Hangover”. Make sure to get out and experience the delicious food, Bangkok is a city of contrasts. You can find delectable fine dining from 5 star restaurants to delicious market stalls roadside that serve a mean pad thai. Get a ride in a tuk-tuk around the hustling and bustling streets of Bangkok. Read in our Helpful tips at the bottom our suggestions for the first things you want to do when you first arrive in Thailand. Highlight of Bangkok – Self GuideD GPS Bike Tours! If you have already experienced Bangkok then you may think driving bikes around the city is nuts, and we did too. Instead of doing a temple day, we highly suggest doing a self guided GPS bike trip around the city that takes you through almost all of the must-visit tourist sites and temples. Good news is that after you leave their office the entire trip is off the main road and there is not a traffic. Plan a good 6-hours for this trip. We suggest making a reservation the day before. The trip takes you past many sights including Wat Pho, Grand Palace, Sanam Luang Gardens, The Giant Swing, Golden Mount Temple, Loha Prasat Temple and much more. Any of the attractions that you can think of the Go Bangkok Tours goes through, so do not plan on checking anything else before doing this first! They told us: “follow this GPS exact” even if you think it is not true. I remember stopping and thinking….can this be right? While going through these small Chinese markets, deserted back roads and parks, and so many other sites. This GPS route takes you through the real Bangkok. The Bangkok that most tourists never see travelling by taxi or tuk-tuk. You will pass locals sitting on the side of the road laughing and pointing you in the right direction. Apparently they see a dozen or so crazy tourists on bikes staring at their GPS here lol. Tell them that Nadine and Fraser with the Laptop Warriors sent you ☺ Super nice people there! We stayed at several different places while in Bangkok at opposite ends of the town. One spot was in the party district, another one was in near the grand palace, and there other one was near China Town. As we are travelling as a couple and are not looking for a shared hostel, we look for bargain hotel rooms (lower to middle priced) and the one we really liked was the Chic Hostel. It did have shared bathrooms and at first we booked it just because of the price and we were not going to spend much time at the hostel, but turned out was more like a super nice hotel with a pool. Some people go to Ayutthaya from Bangkok because it is very close. It is more of an older expat spot. With a tight schedule we suggest heading to Chiang Mai. We review the AirAsia ASEAN Pass for the epic travel deal for flying around Thailand for $160. If you are not flying there are 2 main options, train or bus. You can book online or ask any local tour agent to book a bus or train ticket. Chiang Mai is a magical city surrounded by mountainous jungles in the north of Thailand. It is a true Digital Nomad hotspot with coffee shops open late, super cheap to live and eat out, and always something happening. However, there are no beaches. During February to April you will find the burning season takes over Chiang Mai in a big way making it pretty polluted and uncomfortable. You can get everything you want done in 3 days. Your first day you will probably be tired from a long overnight or day trip so getting out to visit a market or see some of the many temples is a fun way to end the day. No elephant rides here, only happy elephants! Read our article here about why you want to avoid Elephant Riding. Visiting the Elephant Jungle Sanctuary was truly once in a lifetime experience. See how fun it was in our video here. We did a half day tour and it was more then enough. Read our full blog article here. Learn about why it is important to support a sanctuary versus the elephant riding and the inhumane treatment they experience. In Thailand, you should never leave your hotel for the day without your bathing suits. And this is why! We showed up here expecting a big hole ground but turned out to be an epic swimming area, with cliff jumping, beer, and everyone got life jackets to float around. 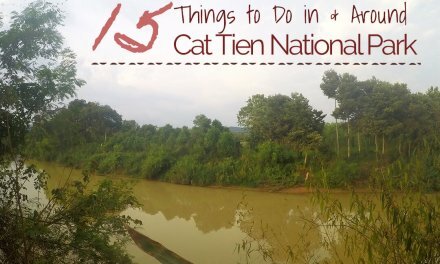 The Grand Canyon is not in the Top things to do in Chiang Mai, but in our opinion it should be. 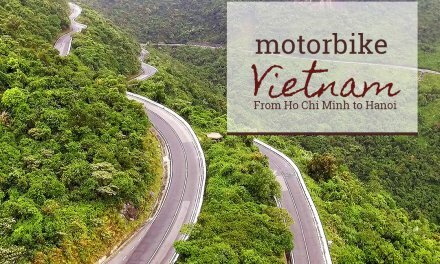 The windy long roads up this mountain, make this an adventurous experience. Don’t worry it’s completely paved and no 4x4’ing. The Doi Suthep temple offers of the highest point overlooking all Chiang Mai. It has a full little community up near the top with lots of restaurants and side attractions along the way. On your way back down, stop at the Monthathan or Huay Keaw Waterfall for a taste of nature. 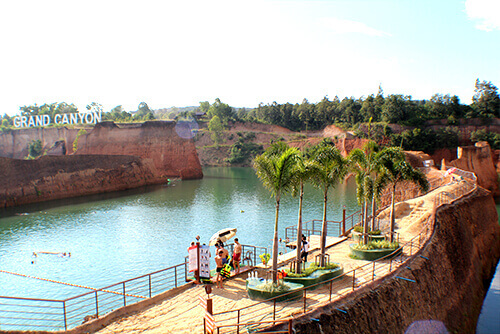 The Monthathan is located in a National Park (200 baht entry fee per person) and offers a challenging nature trail as well. Huay Keaw is hard to miss right at the bottom of the mountain and you don’t need to walk very far to reach it. The Saturday Walking Street at Wua Lai Road is one of the best walking streets. Really good prices, amazing food everywhere. Your biggest challenge: how to fit it all in your backpack. If you miss Saturday night market, there is another good market at Chang Klan Road usually happening daily. Thailand’s national sport is Muay Thai Fighting, and they take it very serious. Attending a fight isn’t for everyone but it is a great deal of fun. You understand the thai enthusiasm for Muay Thai when you attend a fight with locals yelling and screaming. Expect to get asked to purchase expensive drinks throughout. For each fighter, prior to fight they walk around the audience and collect donations for their fight. These fighters went extremely hard and had several good knock outs. In Chiang Mai, there are 2 main stadiums, Thaphae Stadium and Kawila Boxing Stadium. We unfortunately did not have time to take part in a Thai Cooking Class. A big tour option in Chiang Mai is to go for a cooking class. You might be thinking, great we can do this at night, like we thought. Thai Cooking Classes are an all day affair where they pick up you up early from your hotel and go late (with lots of wine). These are usually way outside the city at a farm. With the distance and wine, you will appreciate the transportation. A bonus of Chiang Mai is that this city offers some really great affordability. We suggest you stay in the Old City as this is the heart of the city. Normally we tell you what to do, but in this case, we suggest not to visit the Chiang Mai Zoo. It looked like something out of a horror movie that may have been nice 20 years ago. The animals were sad, underfed and really skinny, and many (like the hippos) did not have enough water. From here you will want to catch (or fly) to Phuket and get ready for the most enjoyable beach times of the trip. If you are looking for a bigger city that has all the modern amenities, but will still has amazing beaches, sunsets, & scuba diving then Phuket is for you! It is a great transportation hub if you are looking to catch a boat to Phi Phi Islands or any of the other islands. Phuket is technically an island, with a bridge connecting the amazing coastline. A ferry ticket is approx. 500 Baht or $15 USD. Phuket is also close to the Ao Phang-nga National Park. The top attractions though are: Siam Niramit Theatres, Phang Nga Bay, some of the elephant’s sanctuaries, Big Buddha Temples, and the vibrant nightlife of Patpong. We had planned one of our trips around attending the annual Phuket Vegetarian Festival. This festival is held during the ninth lunar month of the Chinese calendar. During this festival sacred sacrifices and accompanying rituals are performed to bestow good fortune. During this 10 days there is a strict 10-day vegetarian for the purpose of spiritual cleansing that everyone has to follow. Hence the name, Vegetarian Festival. You need to wear white, not eat meat, no alcohol, and no sexual activities. Many sacred rituals are performed at the templates and can be a unique experience to take part in. Disclaimer, if you don’t like fireworks stay clear of these celebrations. The best way to get to Phi Phi is to take the ferry boat leaving in the morning. It was approximately 300 baht ($9 USD) and takes about 90 minutes (45 by speedboat). The ferries usually go several times a day and there was no need to book in advance, just show up. The popular areas to stay are in Kata for a relaxing vibe or Patpong for an energized party and beach district. 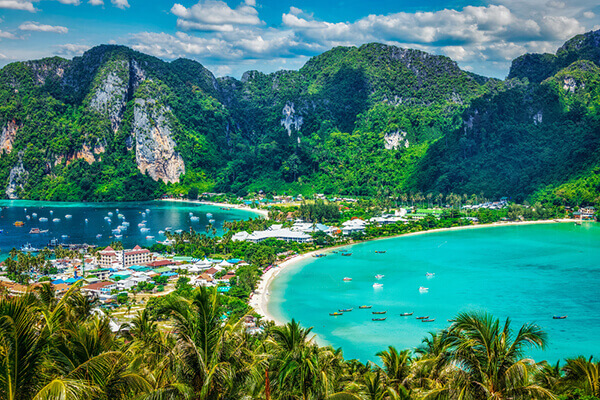 Phi Phi Island is known as Thailand’s Superstar and for good reason. It was the most beautiful beaches we have ever seen. Much of the scenery and landmarks we recognized from movies and postcards that most people only dream about. It is a party vibe and often too crazy for most people to stay more than a day. There are no taxi or tuk-tuks on the Island of Koh Phi Phi, so you have to walk everywhere. The main walkway are filled with restaurants, tourist companies and souvenir shops. However, with the beauty and worldwide attention also comes the crowds and for this smaller island. There are many different tours available, all day, morning, or afternoons. We had chosen one of the most popular tours because we wanted to see these main spots and fit it all in on a day. 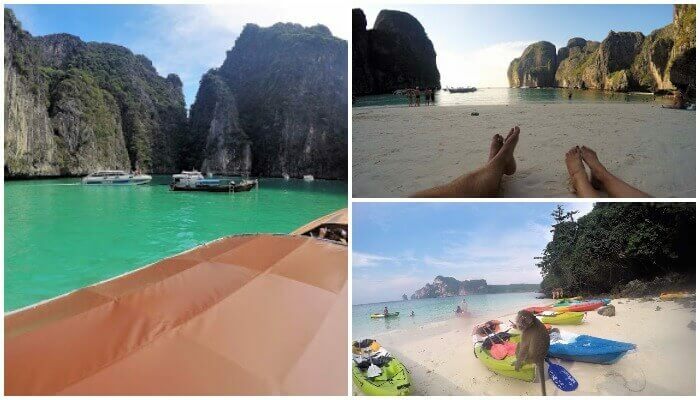 The tour we chose was 400 baht (yes 12 USD) including lunch and water that took us to Monkey Beach, Loh Samah Bay, Pileh Cove, Viking Cave, and the famous Maya Bay where “The Beach” with Leonardo DiCaprio was filmed. Just as a note, there is an additional 400 baht fee to enter Maya Bay, as it is a natural park. Most of the tourist’s companies do not tell you this right at the beginning. They said we did not have to go and could snorkel in the bay instead. However, they parked the boat in a different bay and we walked through a cave to reach Maya Bay or wait there for 2 hours. Now Maya Bay is INCREDIBLE. But really busy, we were happy we saw Maya Bay but the pure crowds definitely took away from it. Maya Bay is the location where the famous movie “The Beach” was filmed. You can also book early morning or overnight cruises that would give you more privacy. In this bay, at night all the Plankton come out, so camping on an overnight boat is a very unique experience. You will also recognize this view from many Thailand posters. It’s a moderately easy hike to the top of the viewpoint that takes about 30 minutes of brisk walking. It is well marked so most people can not get lost! We enjoyed an amazing sunset from this viewpoint. There is a small fee at the top and make sure to bring some bug spray! We had plan to launch our drone near the top, and were attacked by so many mosquitoes that we ran away in defeat. The main area at the top was better, so here are a few pics from our non drone camera. We got there early, with our Bali Beds, and made an awesome day of it. We got a good spot in the shade in front of Loh Dalum Beach…the party spot! From this beach you can kayak to Monkey Beach around the corner. Make sure to bring your snorkel and sun lotion with you. On our snorkeling tour they took us to “monkey beach” but apparently this was the “real” one. There are some other day trips like bamboo and Snake Island. Our friend almost made the mistake of booking the most amazing hotel for a great price on the North side of the island. There are no roads and some of these hotels are only accessible by water taxi. You would have a lot less crowds from this location though. You can easily walk around the Island within 10-15 minutes. Because there are so many bars and an active nightlife you might want to stay in the middle. You will find your booking on Koh Phi Phi will probably be one of your most expensive hotel bookings for your whole trip in Thailand. Boats are always leaving at all times of the day, so don’t worry about booking in advance. Prior to Departure, make your way to the ferry terminal at least 30 minutes in advance. For 500 baht, we got our boat direct from Phi Phi to Koh Samui. This included 2 ferries, about a 4 hour bus, and transfers in between each. You should expect to pay 300 baht to go to Krabi, your next destination. If you decide to do this route in the opposite direction, you should expect to pay double for this same trip, 800baht. Krabi Province consists of 200 islands and stunning white beaches that stretch out for miles on the Andaman Sea. Krabi Town does not have any beaches of its own but is in close proximity to a lot of other great places. However, it does have some amazing rivers in the mangrove forest and visiting local fishing communities is a lot of fun. With your jammed packed schedule, we suggest that using your day in Krabi Town to catch a longtail boat to visit “Raillay Beach”. Claimed to be the most attractive beach in Thailand. What makes it even more unique is that it is only accessible by boat due to the large cliffs on each side. There are no roads or cars and just a few long tail boats and a few bars to spend your evening in. Ao Nang is another one of the main tourist’s spots where millions of people visit each year but yet still is stunningly beautiful. The main mode of transportation to arrive at most of these beach destinations is by a fun ride in a long tail boat. Koh Lanta is well known for it’s very nice laid back Island style. It is not much of a “party town” and does not have a beach walking street. It will take most of the first day of travel from Krabi to get here, so the first night you may just need a travel day or to get a message. The next day you are going to want to go to choose from a tour to the Emerald cave Island or Mu Ko Lanta National Park! If you choose Mu Ko Lanta National Park, plan to spend the day their. Make sure to get food on the way and store it in your backpack in the motorcycle. The monkeys can be quite aggressive about shaking you down for any food you have on you. It was a fun ride by scooter to the tip of the Island, not much traffic at all along the beaches. We had rented scooters and were completely mobile, we stayed at super nice little hotel at the Chom Dao Resort. There was about 12 bungalows that made up this property with a pool and great area for hanging out. It was a distance away from towns but since we had rented scooters were able to travel to the places we wanted. The Main Beach Spot is where you should book a hotel if you are looking to stay closer to the most popular beach spot. Koh Samui is where we spent our first 6 months as Digital Nomads. We loved it! We choose to live here because it had an airport, hospital and an abundance of some of Thailand’s most beautiful beaches. Samui can be a great central hub to jump around to all the neighbouring Islands, Koh Tao and Koh Phangan. While Koh Samui offers dazzling beaches, there are no places to snorkel or scuba dive. We created a detailed DIY Island tour and 3 day Koh Samui Itinerary here or keep reading. Don’t worry, these are done the next days in the islands or tours. In the meantime, check out the AMAZING Beaches!! In fact if you are looking for where to stay or best to visit we created a video with top 8 Koh Samui Beaches with our drone. Night out in Chewang. We liked to call it a beach version of the “Vegas of Samui”. This is the party district, and if you are looking for this, look no further than Ark Bar. Ride through the middle of the Island! If you can not tell already we think the only way to experience a city is to rent a scooter. Koh Samui has one road (ring road) that goes around the entire island. However, there is another road that goes through! You won’t even feel like you are on a beach Island of Koh Samui when you drive through middle road. It truly feels like Jurassic Park and has some fun and challenging Hills. In fact it is so remote (and an entire story in itself) that we even saw a Water Buffalo fight here. Water Buffalo fights are a secret underground and illegal thing. As we were driving here on the remote road we stumbled across tons of vehicles and spectators all watching a Water Buffalo fight. I wish I had my camera!! As we stopped to see the excitement, we had to run as 2 of the fighting buffalo came charging in our direction, just missing our bike. For a good 4x4 adventure and a beautiful waterfall, at the top follow the signs to see Khun Si Waterfall. Waterfalls. On Koh Samui, they are crazy about their waterfalls. You will see directional signs for waterfalls everywhere. Depending on the time of year you are visiting, these can be fantastic or simply look like a small drain. After rainy season, the best time of year to visit is in December. Ark Bar Beach Resort. This is the best party spot and is located on the beach in Central Chewang. This is the choice for most backpackers and travelers. Reasonably priced for Chewang and rooms are nice. Recommended Area. We personally recommend Lamai for our friends (that includes you as well) for people that wanting to book a stay in Koh Samui. It is similar to Chewang but has better pricing for food and has just as nice of a beach that is less crowded. You will be able to walk everywhere, hosts the Sunday Night Market (Samui’s largest market), as well as the Free Saturday Night Muay Thai Fights in the central plaza. Chewang Hostels. Our friends stayed at the My Samui Hostel and enjoyed it, Click Here to check out a few other hostels in the same area. Fishermen’s Village is located in the quieter area that has a lot of shopping, and is located on the beautiful (but slightly busy) Bophut beach. They have a bunch of restaurants and shops that you can walk through with a really fun night market every Friday Night. This is more expensive area. There are 4 main ferry ports, Maenam, Lipa Noi, Big Buddha and Nathon Ferry Pier. They all go to the same destinations, but each ferry port offers a different boat option. Either a fast catamaran or a vehicle passenger boat. Koh Samui taxes are very expensive. Most operators will not budge on their pricing. We referred to it as the Taxi Mafia. There is no Uber, but there is a service called NaviGo that is more affordable and have an easy to use app. The other option is to catch a Songthaew (the red Trucks that drive around) that cost anywhere for 20 to 60 baht (may try for up to 100). They drive around the entire island leaving from Nathon Pier every 10 and 20 minutes. Since Koh Samui is just a circle if you give yourself time you will get to any of the ports. 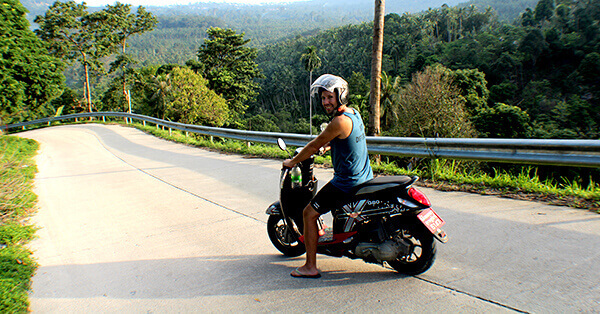 Get the full Koh Samui Transportation Guide here. Koh Phangan is most known for the legendary full moon party. It is an Island boasting so much more than that. On the north coast lie quieter, white-sand beaches including Hat Khuat and Hat Thian. But the rest of the island has an extremely quiet side where a lot of expats live and call home. It is only about a 45 minute ride from Koh Samui. For hotel accommodations for the Full Moon Party, all hotels on the Island require a minimum 5 day booking. 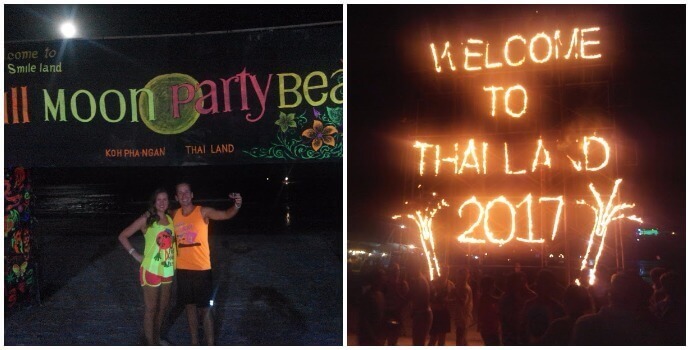 So for one week of the month is extremely expensive to stay is this is the home of the Full Moon Party! 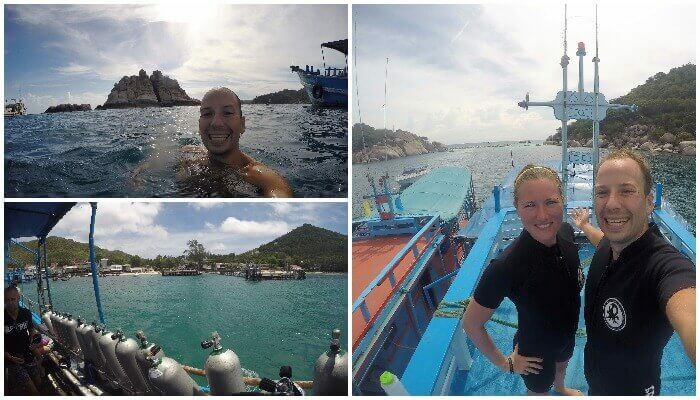 If Scuba Diving or snorkeling is your thing, then Koh Tao will not disappoint. You can skip Koh Phangan if you want to spend more time here. Koh Toa is magical, everything is built along this walkway on the beach and the culture here is one of the best we have seen. There must be 50+ dive shops, awesome pub crawls, and beautiful beaches everywhere. You must sign up for at least a snorkeling tour and if you are into scuba diving (or would like to) this was one of the nicest dive places we have seen, not too mention the best pricing. We took the 4 day open water certification with Roctopus Dive and it was AMAZING! We got our RAID Certification to dive up to 18m (60ft). The certification was over 3 days where you do about 5 different dives and all equipment / training / license fees. The total cost was 8600 baht ($245 USD). We had a small class of 3, with a maximum of 4 per instructor. We really wanted to do the Sail Rock Trip (and will be back) this is apparently where you can see the White Sharks and more. You will want to stay near Sairee Beach as this is the main walkway. You will need to book with Lomparayah to get back to Samui, and to make things easier may see what specials they have for going back to Bangkok. If you took advantage of the awesome AirAsia ASEAN pass you can fly, if not catch the long bus ride. The last few days you will spend considerable time travelling and most likely catching up after an epic trip. It is the time to return to Bangkok to catch your return flight. International Drivers License – In Canada at least, there is no exam for this, just paid $20 usd and receive your International Driver’s License in the same appointment. Paid for itself after my first traffic stop. Monsoon season. Click here for our video about what’s it’s like on Koh Samui in rainy season. Download an Offline map, Maps.me (Free App). Similar to Google Maps but has been very reliable. Download Apps – Uber or Grab Taxi (Southeast Asia’s version of Uber) We used Uber as many places as we could but Grab Taxi is even more popular. Our first Uber Ride cost 104 Baht ($3 USD) for a 40 Minute Ride where we went over 8 kilometers. Most taxi wont even let you in for 100baht. This way you can side step negotiating with the tuk-tuk driver who’s original offer is triple that. Have an unlocked phone – I bought a cell smart phone that works fine for $70 USD so if your phone can not be unlocked it may be worth new. 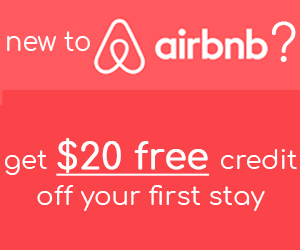 Get your $25USD Air BnB Travel Credit Here. Get a Thailand Sim Card. It costs about $12USD to buy a sim card with a month of data. Being able to use data on the road is priceless. The two main companies are TRU or 3BB. On most basic data plans they include free wifi in major cities. 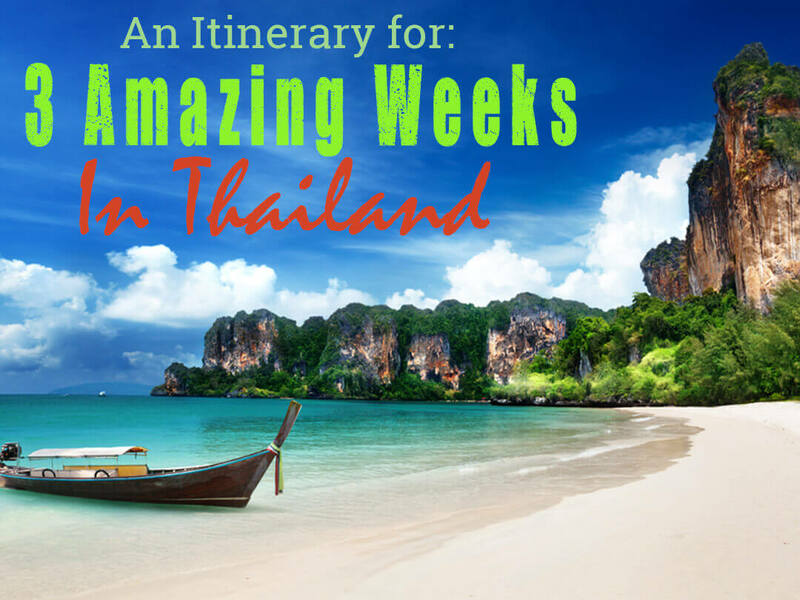 Thailand is one of those magical places and truth be told the above schedule is an action packed schedule where you are going to be putting in some long and early days. The Thai people are beautiful and so friendly. It is very important to note that in Thailand they follow a social etiquette of “saving face”. So if something goes wrong, smile and try to talk through it. Getting angry will mean you loose face and some Thai will even just walk away from you. If we did not want to travel to as many places as above, we would suggest choosing to focus on the Krabi Area, or Koh Samui. This way you can make quicker trips (even day trips) to amazing spots without having to pack up your entire life every night. P.S.S. If you have not signed up for your $25 USD Credit with Air B N B you should do it now! Explore the 8 Most Popular Koh Samui Beaches here, all filmed by drone.